﻿ Hebrews 1:9 "YOU HAVE LOVED RIGHTEOUSNESS AND HATED LAWLESSNESS; THEREFORE GOD, YOUR GOD, HAS ANOINTED YOU WITH THE OIL OF GLADNESS ABOVE YOUR COMPANIONS." You have loved righteousness and hated lawlessness; this is why God, Your God, has anointed You, rather than Your companions, with the oil of joy. You have loved righteousness and hated wickedness. That is why God, your God, anointed you rather than your companions with the oil of gladness." Thou have loved righteousness and hated lawlessness. 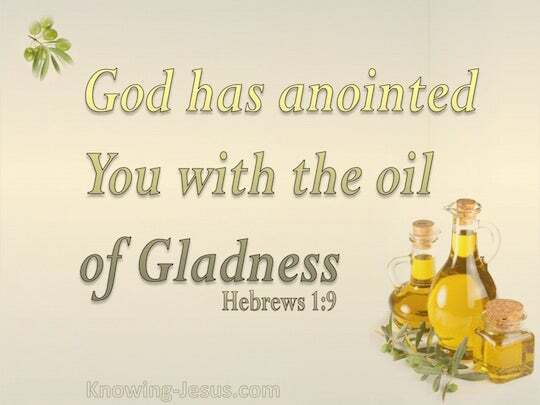 Because of this, God, thy God, anointed thee with the oil of gladness above thy companions. Thou hast loved righteousness, and hated iniquity; Therefore God, thy God, hath anointed thee With the oil of gladness above thy fellows. You have loved righteousness [You have delighted in integrity, virtue, and uprightness in purpose, thought, and action] and You have hated lawlessness (injustice and iniquity). Therefore God, [even] Your God ( Godhead), has anointed You with the oil of exultant joy and gladness above and beyond Your companions. You have loved what is right and hated what is wrong, therefore God, your God [i.e., the Father], has placed you above your companions when He anointed you [i.e., specially chose you] with the oil of joy [i.e., your selection as king was a joyous occasion]." Thou hast loved righteousness, and hated iniquity; therefore, God, thy God, has anointed thee with the oil of gladness above thy fellows. You have been a lover of righteousness and a hater of evil; and so God, your God, has put the oil of joy on your head more than on the heads of those who are with you. You have loved righteousness and hated lawlessness; therefore God, your God, has anointed you with the oil of gladness above your companions." thou hast loved justice and hated iniquity; therefore God, even thy God, hath anointed thee with the oil of gladness above thy peers." Thou hast loved righteousness, and hated iniquity; therefore God, thy God, has anointed thee with the oil of gladness above thy comrades. You have loved right and hated wrong! 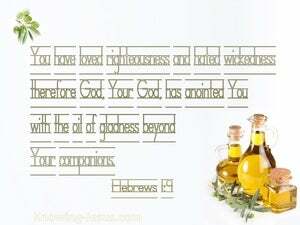 That is why God, your God, has anointed you with exhilarating oil beyond all your comrades." Thou hast loved righteousness and hated iniquity; therefore God, even thy God, hath anointed thee with the oil of gladness above thy fellows. 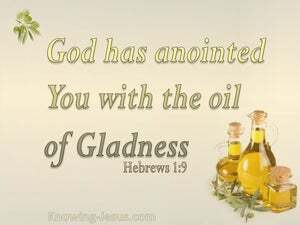 Thou hast loved righteousness and hated iniquity; therefore, God, even thy God, has anointed thee with the oil of gladness above thy fellows. Thou hast loved justice, and hated iniquity; for this God anointed thee, thy God, with the oil of lively joy above thy partakers. You have loved righteousness, and hated iniquity; therefore God, even your God, has anointed you with the oil of gladness above your fellows. You have loved righteousness and hated lawlessness; because of this God, your God, has anointed you with the olive oil of joy more than your companions. You have loved righteousness and hated iniquity, therefore God, Your God, has anointed You with the oil of gladness above Your fellows." Thou hast loved righteousness and hated iniquity: Wherefore God, which is thy God, hath anointed thee with the oil of gladness above thy fellows." Thou hast loved righteousness and hated lawlessness; Therefore did God, thy God, anoint thee with the oil of gladness beyond thy comrades. You have loved righteousness and hated lawlessness. So God, your God, has anointed you over your companions with the oil of rejoicing." You have loved righteousness, and hated iniquity; therefore God, your God, has anointed you with the oil of gladness above your fellows." Thou lovedst righteousness, and hatedst iniquity; therefore God, thy God, anointed thee with the oil of gladness above thy fellows." Thou hast loved righteousness and hated wickedness; therefore God, thy God, anointed thee with the oil of gladness above thy companions. Thou hast loved righteousness, and hated iniquity; therefore God, thy God, hath anointed thee with the oil of exultation above those who partake with thee." Thou hast loved righteousness and hated lawlessness; therefore God, Thy God, has anointed Thee with the oil of gladness beyond Thy companions." You loved the right and hated wrong; so God, your God, anointed you, with oil of exultation beyond all your companions." thou lovest righteousness and hatest iniquity; therefore God, even thy God, hath anointed thee with the oil of gladness above thine associates." To grant those who mourn in Zion, Giving them a garland instead of ashes, The oil of gladness instead of mourning, The mantle of praise instead of a spirit of fainting So they will be called oaks of righteousness, The planting of the LORD, that He may be glorified. You have loved righteousness and hated wickedness; Therefore God, Your God, has anointed You With the oil of joy above Your fellows. "But as for Me, I have installed My King Upon Zion, My holy mountain." The LORD tests the righteous and the wicked, And the one who loves violence His soul hates. He loves righteousness and justice; The earth is full of the lovingkindness of the LORD. For the LORD loves justice And does not forsake His godly ones; They are preserved forever, But the descendants of the wicked will be cut off. I delight to do Your will, O my God; Your Law is within my heart." From Your precepts I get understanding; Therefore I hate every false way. Therefore I esteem right all Your precepts concerning everything, I hate every false way. "The fear of the LORD is to hate evil; Pride and arrogance and the evil way And the perverted mouth, I hate. Hate evil, love good, And establish justice in the gate! Perhaps the LORD God of hosts May be gracious to the remnant of Joseph. He found first his own brother Simon and said to him, "We have found the Messiah" (which translated means Christ). "For He whom God has sent speaks the words of God; for He gives the Spirit without measure. Jesus said to her, "Stop clinging to Me, for I have not yet ascended to the Father; but go to My brethren and say to them, 'I ascend to My Father and your Father, and My God and your God.'" Let love be without hypocrisy Abhor what is evil; cling to what is good. The God and Father of the Lord Jesus, He who is blessed forever, knows that I am not lying. what we have seen and heard we proclaim to you also, so that you too may have fellowship with us; and indeed our fellowship is with the Father, and with His Son Jesus Christ. 'Yet this you do have, that you hate the deeds of the Nicolaitans, which I also hate. 'So you also have some who in the same way hold the teaching of the Nicolaitans.